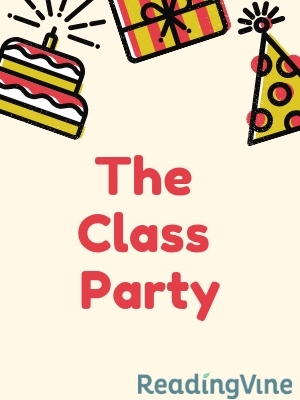 The second grade class party is scheduled for this Friday, but Logan forgot all about it! Will she be able to bring cupcakes to the even like she promised? Students will read the passage and answer follow-up questions about vocabulary and other story elements. Back on the first day of school, Ms. Ryan told all the children that at the end of the year there would be a class party for the second grade. Everyone was very excited. June seemed very far away at the time, and the students kept their minds on their studies most of the time. Slowly but surely, fall turned into winter and winter turned into spring. Soon it was time to plan the party. Ms. Ryan posted a list of things for students to bring. All the food would be shared with everyone. Logan signed up or cupcakes. One night at dinner, Mom said to Logan, "I can't believe tomorrow is the last day of school. My, how time flies!" Logan dropped her fork. "Oh no!" she cried. "I forgot to tell you before, but tomorrow is the class party. I'm supposed to bring cupcakes for everyone." Logan's mom frowned. "Logan, I don't think there's enough time to bake cupcakes before bed. You'll have to go to the party without cupcakes. Next time, please let me know sooner." A tear ran down Logan's cheek. "I'm sorry. I forgot because I didn't have any other homework this week." Logan sniffed. "Well," said Mom, "I guess we have time to bake the cupcakes, but they will be too warm to put icing on them tonight. The icing will melt instead of sticking to the cake. But I have an idea." Logan and Mom cleared away the dinner dishes and began to make some cupcake better. It was lucky that Mom had a box of cake mix in the pantry. Mom cracked the eggs while Logan added the oil. Together they mixed the batter and spooned it into the cupcake pan. While the cupcakes were in the oven, Logan asked, "What about the icing?" Mom opened the pantry and pulled out brightly colored sprinkles. "I know we usually use these for ice cream, but you can pack them with the cupcakes and let your friends decorate their own cupcakes. By the morning the cupcakes will be nice and cool. How does that sound?" Logan smiled. Her classmates would love to decorate their own cupcakes. "It sounds great!" said Logan. "Thanks, Mom. You're the best." 1. What is Logan's problem in the story? 2. What kind of person is Logan's mother? 3. How does Mom solve Logan's problem? 4. Do you think Mom's idea is a good one? Why or why not?